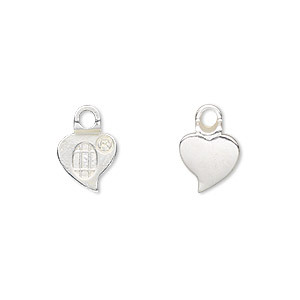 Bail, Aanraku®, glue-on earring, silver-plated "pewter" (zinc-based alloy), 13x9mm with 9x9mm heart flat base. Sold per pkg of 4. Item Number: H20-7154FX Have a question about this item? Glue-on Aanraku earring bails have a decorative heart design and closed loop. 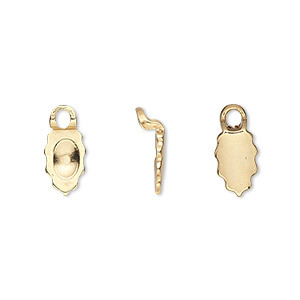 No need for wire wrapping or drilling holes into pieces--simply glue the bails to components, cabochons or freeform pieces. The silver-plated Aanraku bails have textured bases to hold epoxy or glue in place and work best when attached to non-porous surfaces such as glass. Aanraku bails are nickel free with a lacquer finish to protect the plating. Using a 2-part epoxy is recommended. 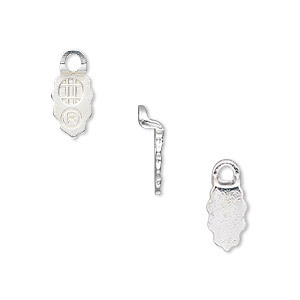 Bail, Aanraku®, glue-on earring, silver-plated "pewter" (zinc-based alloy), 13x9mm with 9x9mm heart flat base. Sold per pkg of 24. 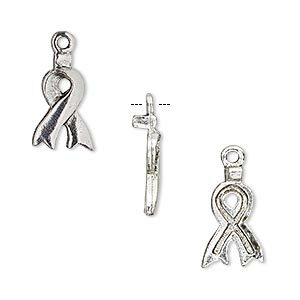 Bail, glue-on earring, antiqued silver-plated pewter (tin-based alloy), 18x9mm with 13x9mm awareness ribbon. Sold per pair. 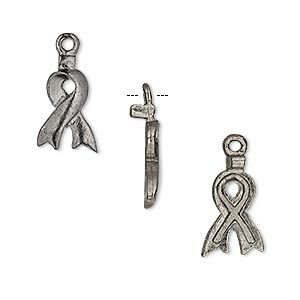 Bail, glue-on earring, gunmetal-plated pewter (tin-based alloy), 18x9mm with 13x9mm awareness ribbon. Sold per pair.